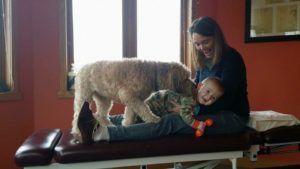 Innergy Chiropractic Care - Colleen Hathaway, D.C.
My chiropractic philosophy is very simple and powerful: the body contains an innate wisdom that is constantly desiring equilibrium. This wisdom will work at all costs to find a safe place to live within your body. Many times physical symptoms arise to get your attention. As part of daily living, we are exposed to many stresses: physical, mental, emotional, or chemical. When we are unable to adapt to these stresses the result is misalignments or subluxations of the structures of the spinal column occur. This causes interference to the delicate communication between our nerve system and ALL of your other body system. Chiropractic adjustments allow your body to release the stored tension along your spine facilitating a free flow of vital information essential for all human functions. Many times physical symptoms arise to get your attention, such as, back pain, headaches, ear aches, digestive issues, anxiety, dizziness and many others. These symptoms are what motivates people to make an appointment. I see these symptoms as the body’s way of telling us what needs to be done. Therefore, one of my favorite parts of providing care for my clients is educating them on what their body is attempting to tell them. In essence, we form a partnership with one goal in mind, to help their body’s innate wisdom find balance. This philosophy applies to people of all ages, I like to say, cradle to grave. That being said, I receive regular inquires regarding how chiropractic can help infants and children. This is an excellent question. The time frame from birth to age 2 is the most dynamic and important phase of brain development in humans. The overall brain size from 0-2 reaches 80-90% of adult volume by age 2. This rapid growth in the brain deserves attention and care and that is what chiropractic care addresses. My practice specializes in infant and child chiropractic care because the impact of removing interference from this system early on in life sets the stage for the child to grow and develop in a healthy way.